As midterm-fever rips across the United States, President Obama hit the campaign trail to rally voters in the upcoming Maryland Gubernatorial election. The President spoke to a crowd of voters in Upper Marlboro High School, encouraging voters to come out and show their support for Lt. 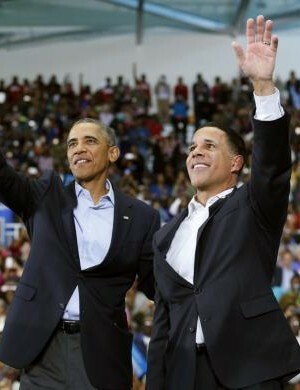 Governor Anthony Brown's election campaign. While he worked hard during his re-election in 2012, President Obama isn't exactly known for his vigorous midterm campaign appearances. When the President addresses voters in person, he's nothing but business. Some Maryland voters, however, did not seem to take the President so seriously, as many attendees walked out on Obama, mid-speech. According the Baltimore Sun, Brown's campaign holds a 7-point lead over Republican candidate, Larry Hogan. However, the Sun also noted that a considerable amount of Brown's supporting demographic groups--namely young voters, among others--are historically the least likely to cast their votes in the election. Some speculate the walk-out as a bad omen for Brown and the Democratic Party abroad. Others blame the President's current unpopularity, as seen by his recently abysmal approval rating. And others still think nothing of the audience's reaction to the President's speech. What do you think the audience bail-out means for the midterm election this year?